Library: Korean | ID Theft & Account Fraud - Prevention & Cleanup (Korean) . Library: Korean | Improve Your Credit - Put Bad Credit Behind You (Korean) . Library: Korean | Families and Credit Cards (Korean) . This educational brochure is designed for parents who are weighing the merits of giving their children credit cards. The topics covered include youth and credit cards, adding cardholders to your account, secondary cardholder policies, payment options for kids while they’re traveling and helping young people understand the importance of good credit. Library: Korean | Good Credit - Build it and keep it (Korean) . Library: Korean | Workplace Privacy (Korean) 근무 중 여러분의 권리 . To protect your personal privacy and your job, you should know when and how employers can monitor and gather information about you. This publication explains some of the situations in which monitoring might occur in the workplace and explains your privacy rights as an employee. Library: Korean | Internet Safety (Korean) A computer user's guide to privacy and security. This publication outlines ways that you can protect yourself and your computer when you use the Internet and email. Library: Korean | Staying on Track With Credit (Korean) How to use credit wisely. Credit can be a valuable financial tool for consumers who understand its costs and benefits and how to use it wisely. This brochure defines open-ended, or revolving, credit, including credit cards, home equity lines of credit and overdraft lines of credit, and discusses the pros and cons of using credit. It includes tips on high-cost credit to avoid. Library: Korean | Recognizing Credit Card Fraud (Korean) . Credit card fraud happens when consumers give their credit card number to unfamiliar individuals, when cards are lost or stolen, when mail is diverted from the intended recipient and taken by criminals, or when employees of a business copy the card or card numbers of a cardholder. This new Consumer Action publication explains how to recognize and avoid many forms of fraud that involve credit cards, such as skimming, phishing, ID theft and counterfeit cards. 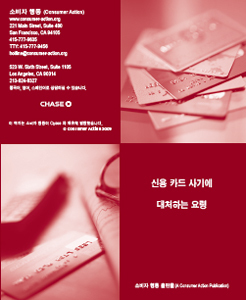 Library: Korean | Saving Your Home from Foreclosure (2009) (Korean) . Library: Korean | Leave me alone (Korean) (2008) Your privacy online—and offline. Leave Me Alone! Your Privacy Online - and Offline explains the concept of personal privacy and why it is important to be careful about who has access to your personal information. Topics covered include privacy in cyberspace, cutting down on unwanted junk mail and spam e-mail from marketers and ‘top ten’ ways to protect your privacy on and off the Internet.